You can easily plan your own NO FLY holiday in the UK or in Europe The days of relying on package air holidays holidays and travel agents seem to be over. The internet has seen to that. Planning your own holiday in the UK or abroad is now so simple if you follow a few easy steps. Many people dislike the hastle of flying and are choosing a NO FLY holiday this time. See our blog on why people hate flying. A holiday should be a relaxing time, with as little stress as possible. Sadly airports these days are more like cattle markets, where you the poor passenger are herded from one place to another. So where do you want to go on holiday? There are so many very good reasons for choosing to holiday in the uk. The weather is predictable with extremes of heat or cold unusual. The food is reliable and 'holiday tummy' is unlikely. The people speak (almost) the same language although on a recent visit to Glasgow we struggled at times! 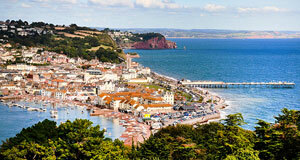 Planning a holiday in the UK boils down to some simple choices. Do you want to stay in a hotel? Most people choose a hotel for their UK holiday but remember that there are other choices. Some people prefer to camp or to caravan, or to hire a mobile home or a luxury lodge. You can even go glamping these days, staying in proper beds with real bathroom facilities. However, assuming you want to stay in a hotel in Great Britain, you can either join an organised coach holiday where you are escorted by a tour manager or you can book a hotel independently. The rise of the internet has meant that it is often much cheaper to book a hotel online rather that to telephone the hotel and to then pay the standard price. So the main travel choices in the UK are to drive yourself and book the hotel yourself or to join an organised coach tour. Some people prefer the more intimate fun of a coach holiday, because you join the coach and immediately become one of the party. You travel and stay with the same group on people and invariably make some new friends to add to your Christmas card list. However, if you prefer to self-drive you will have total freedom to explore as you wish and to take your holiday at your own pace. You can even plan a touring holiday, by booking two or more hotels along your chosen route. By driving yourself, you can stop for lunch anywhere that takes your fancy, or visit attractions along the way that you did not even know were there. I bought some delicious 'scrumpy' cider in this way when we chanced upon a cider farm. If you are in no rush, you can choose to take part of the journey on 'B' roads and slow the pace down a little. You never know waht you will come across, a woolen mill, a tiny art gallery or a quaint antique shop. At the very least you will arrive having really enjoyed your journey and perhaps with a jar of home-made jam or somepickles. Do you hate flying as well as us? Flying naturally has some advantages, but oh, so many, disadvantages. Wherever you are travelling to, even if it is in nearby Europe, you seem to waste a day travelling. Much of the day is spent in getting to the airport, then waiting around to pass security checks, followed by much more waiting. Even a short flight seems to take up the whole day and very few people actually enjoy flying. How much better is it join Eurostar at London St Pancras or to catch a ferry across the channel? You can either drive yourself, which is far easier than you may think, or you can join an organised coach tour holiday. There are many advantages to both. Driving yourself is so much easier these days as the ferries are brilliant and European roads seem so much less crowned than ours. The pace of your holiday is so relaxed and you can make detours to see pretty French villages along the way, perhaps stopping for lunch in a sleepy hamlet whre the pace of life is reminiscent of bygone days? A coach holiday to anywhere in Europe has the advantage that an experienced tour guide is there to look after your interests at all times. If the ferry is delayed, if there are roadwork on the way or if any of a thousand problems occur, then there is an experienced guide to sort out the problems. The highly experienced driver will have seen it all before and between them, they will sort out any problems. Your job is just to relax and enjoy yourself as you make the journey part of the holiday. 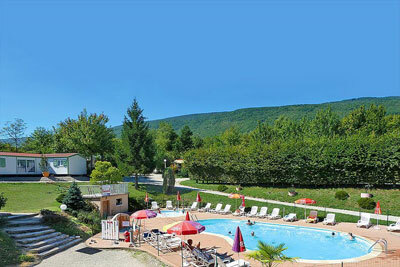 Many coach tours stop overnight in France at a medium quality hotel. All you have to do is to pack a small bag with your night things and leave your cases on board the coach. You will usually enjoy dinner in the hotel and perhaps a few glasses of wine, before settling down for a good nights sleep. In the morning, after a continetal breakfast you will set off again to complete your journey to your hotel and the start of your holiday proper. Some companies also offer 'express' coaches that drive non-stop through the night to your destination. This gives you an extra night at your destination hotel, but has the downside that you have to try to sleep on the coach through the night. I can sleep on a bicycle, but my wife Chris cannot ever seem to settle down unless she is in her own bed. There are two drivers who take it in turns to drive, so it is perfectly safe but I personally prefer the unhurried approach. Or how about a rail holiday? The ultimate adventure is to 'let the train take the strain'. The gateway to Europe by train is the glorious St Pancras station in London. This beautiful station has been totally revamped and is now the home of the fabulous Eurostar to Paris. From stations in Paris, which is a short and easy journey, the whole of Europe awaits you as TGV high speed trains depart to all corners of Europe. Simply book a hotel in your chosen final destination then book Eurostar tickets to Paris and TGV tickets to your final desitination. What an adventure? 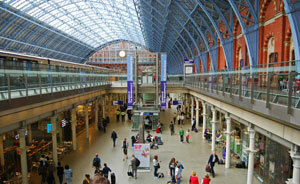 From the moment that you arrive at St Pancras station your journey becomes an exciting part of the holiday. Costs are remarkably low as well and you get an extra dimension to your holiday. See our blog ' What is it like to travel across Europe by train'. Train travel takes us back to the days of George Bradshaw as he published guides to both UK and European rail desinations. Train holidays invoke the early days of holiday travel as there was often no other option that the rails to get you to your final destination. The difference nowadays is that modern trains are fast, smooth, quet, clean and air-conditioned, so you will be travelling in far greater comfort than the Victorians were able to. We travelled on a TGV tarin to Spain and at times exceeded 185mph, although we would not have known this if it was not for the speedometer at the end of the carriage. Not quite as fast as air travel but, oh so much more comfortable. You can't stroll to the bar of the buffet car on most aeroplanes! We had also bought lunch at the Marks & Spencer shop situated within St Pancras station, enjoyed a delicious salad, fresh fruit and some innovative wine glassed that had the contents sealed under a foil lid like yogurt cartons. Try taking those on board an aeroplane!